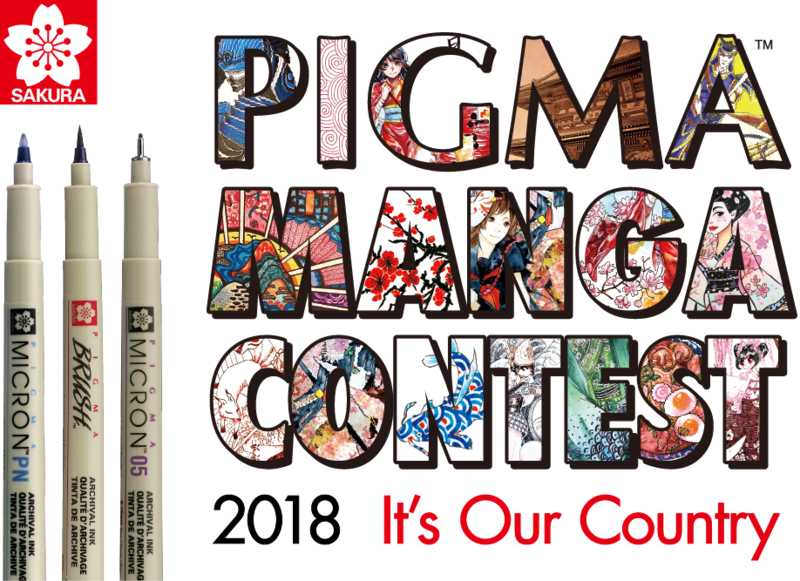 PIGMA MANGA CONTEST｜SAKURA COLOR PRODUCTS CORP.
We received 157 entries from 34 countries. The following are the results of our top selection. My Mexico. Owner of traditions and our voices. In every corner of our lives we find vestiges of a culture that overcomes rites and fashions, that shines in hundreds of lights and colors that tie our lives with roots made of legends and legacy. All together, all united.Let's be art with Mexico. 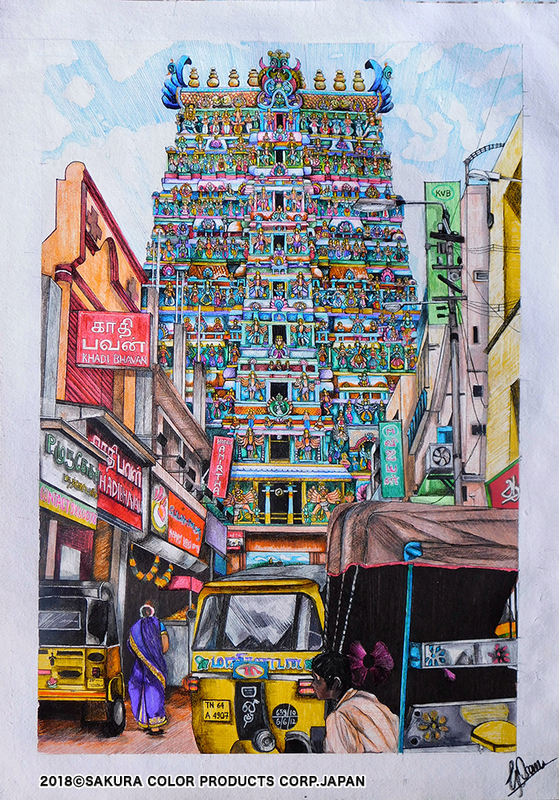 Based on the real life streets adjacent to the Madurai Meenakshi Temple in Southern India, I wanted to depict the contrasting yet harmonious existence of ancient structures along with modern amenities in India. There are several locations across India that display such a contrast within its milieu. The reason I chose to depict this particular temple because of its vibrancy and intricate details. Indian Temples typically flaunt a towering structure called the shikara in the Northern Regions and the gopuram down south. A characteristic of such a structure is how several small sized sculptures depicting various deities are placed. In this illustration I used sakura koi watercolors pocket field sketch box, sakura pigma black, I used GellyRoll White to give shine and I used the Pigma Brush pen and Pigma Micron PN for the contour. Word in nahuatl whose meaning is "Origin and beginning". 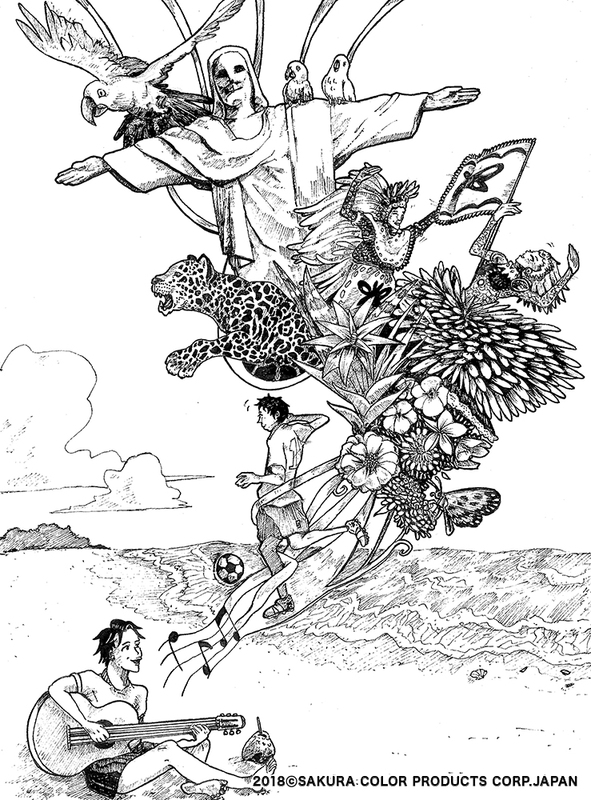 In this illustration I want show with symbolism and culture the origin of my country. I have represented the god of war: Huitzilopochtli, who sent the eagle to lay in the nopal cactus as a sign of the foundation of Mexico-Tenochtitlan. 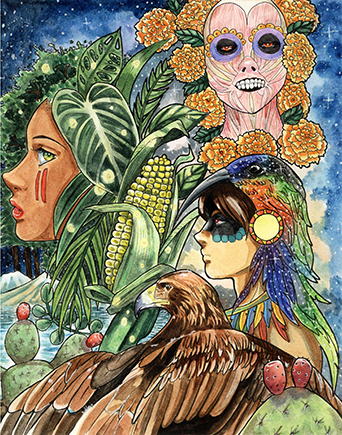 There is an eagle who looks towards the nopal cactus in the middle of the lake of Texcoco and in the background the volcano Popocatepetl and the goddess Chicomecoatl, goddess of corn, the main food of mexico and the vegetation, she has plants and trees instead of hair and the goddess Mictlancihuatl the lady of the dead, surrounded by cempasúchil flowers,flowers that are used as tradition on the "dia de los muertos", nowadays she is know as "la catrina". 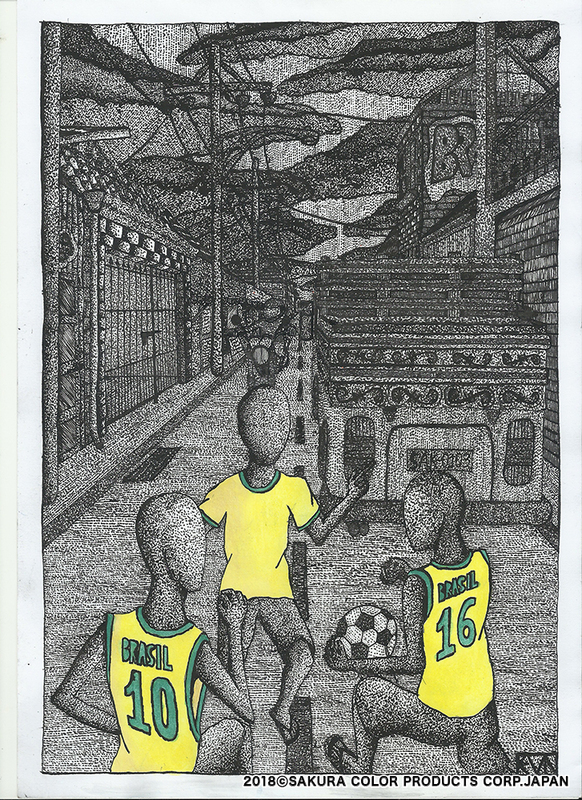 Comments: "a typical street of the Brazilian suburb"
What animal is symbolical for Mexico? They say it is an eagle because of the legend of how the city of Aztecs was founded. And it is probably so. Nevertheless I have my own idea about it. For me it could be perfectly a beautiful versicoloured lizard. Its skin has a clear and firm structure and is adorned with intricate and vivid ornaments that interlace one with another and take shape of some ancient writings. We can find this kind of ornaments everywhere on Mexican traditional fabrics and ceramics that impress us with their rich imagination and innumerable quantity of colours. 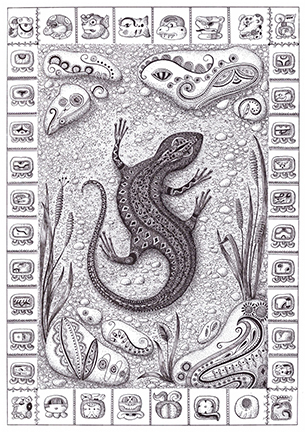 The old wise lizard is warming itself in the bright southern sun since time immemorial… Hundreds, thousands of years are passing by. 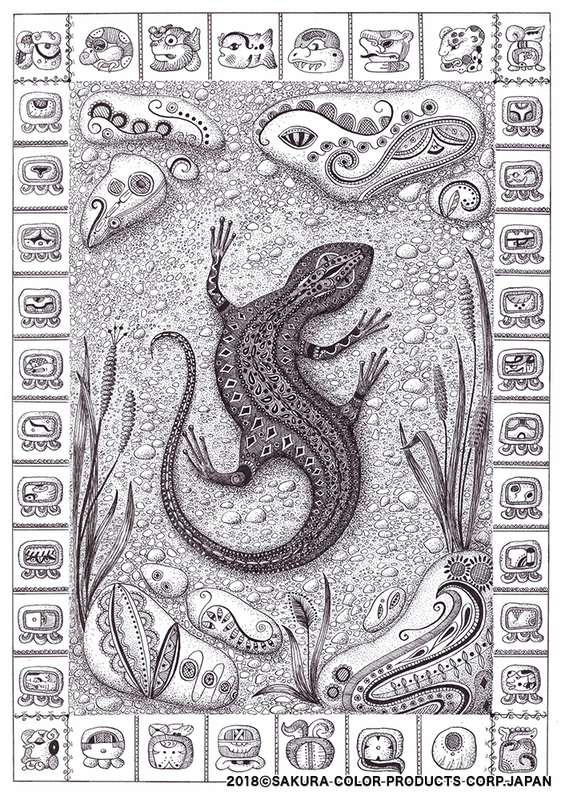 The lizard is observing how the world is changing, how cities, countries, nations are arising and disappearing – and the lizard is still sitting there, immutable, hiding itself between the stones and keeping secrets incomprehensible to the human mind. Maybe some of these secrets were left to us by Mayas in their glyphs and writings? 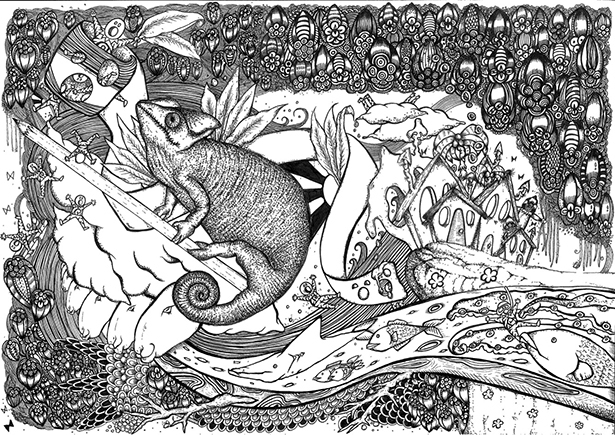 The concept of the work is the harmony and coexistence of nature, animals, humans and indigenous spirits of Australia. Our country has peace, amicability and an incredible diversity, it is without a doubt a blessed country. 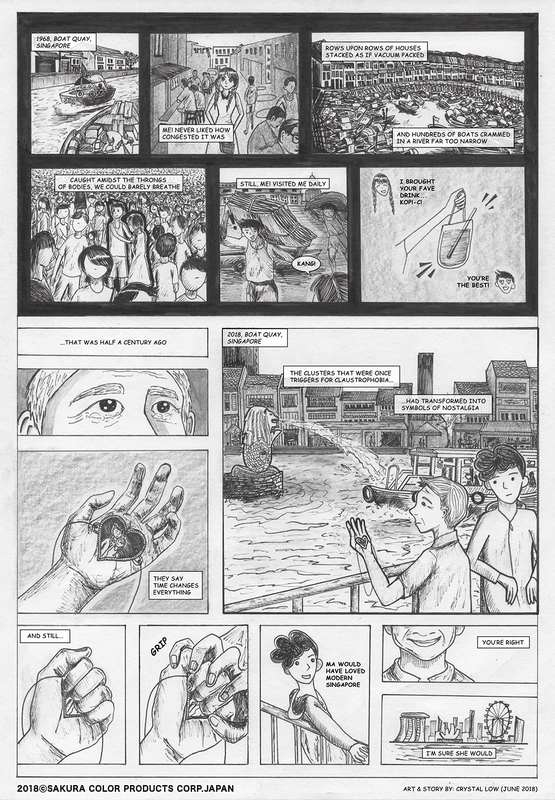 This one-page manga intertwines Singapore's history with a love story that resists the forces of time. 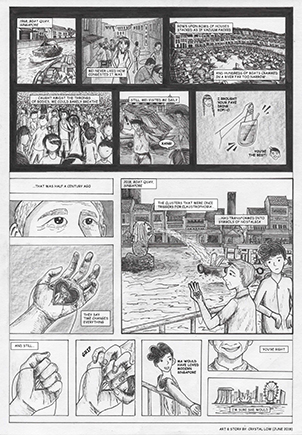 The scenery and view of Boat Quay is repeatedly depicted throughout the manga to show how a particular place and sight can become so familiarly associated with a person or a relationship. 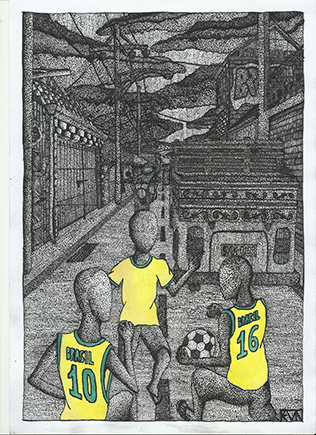 When the main character visits Boat Quay, he cannot help but reminisce the days he spent in his youth with his deceased wife. This conveys the concept that places can store personal memories and our countries are more than just physical homes to us. Our countries where we grew and developed contain so many important pieces of our memories that they have become our emotional homes as well. The manga also contrasts Singapore's rapid and almost unrecognizable transformation from its humble beginnings as a small port to a bustling first-world hub with unchanging love that the main character has for his deceased wife. No matter how much our country changes, the memories continue to live on in these transformed places. It is our country and it is our home. No amount of change can erase our past. Nothing can rob us of our experiences, feelings, and memories. 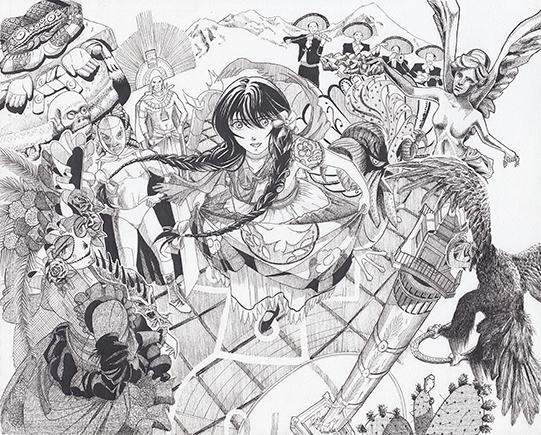 The manga was drawn purely by Pigma Micron (0.05, 0.1, 0.3) as well as the use of Pigma Brush to fill in the large portions of black. I also used pencil to create the grey tones in some of the panels. Finally, the dialogue was inserted digitally. Other than the dialogue, nothing has been changed about the original artwork done using ink on paper. The concept in this illustration is the diversity in Malaysia, a country with multiracial community. In Malaysia, people come from different races. Despite the diversity, unity thrives in the country. The headpiece worn by the lady is a symbol of unity and equality. The pointed tips symbolize equality between two sides and the flattened middle part symbolizes agreement and unity of both sides. Within Malaysian society there are the Malay culture, Chinese culture, Indian culture, indigenous culture, and many others. Malaysia's ethnic diversity is a blessing as we celebrate each festivals of all of the races with performances of traditional dances like the Lion Dance, Flat Horse dance, Ngajat dance, accompanied by customary musics such as the gamelan, seruling buluh (bamboo flute), and Chinese lute. Besides, traditional elements like the Wayang Kulit (shadow puppet theatre art) and the Wau Bulan (moon-kite) are acknowledged as Malaysia's most attractive national symbols. The nature and wildlife shows that Malaysia practices sustainable development to ensure that the flora and fauna are preserved and protected for a better future. The Hibiscus is honored as the country's national flower and the Rafflesia is the world's largest flower which can be found in Malaysia. With a unique, long, curved bill and a bright upturned casque on their heads, the Hornbill is known as Malaysia's national bird. Furthermore, the magnificent Petronas Twin Towers and the Kuala Lumpur Tower are celebrated as the global symbols of a modern Malaysia. Last but not least, Malaysia's cuisine reflects the multiethnic makeup of its population, and is defined by its diversity. Nasi lemak (fragrant rice dish), satay, ABC (bean ice), and kek lapis (layered cake) are some of the scrumptious examples. 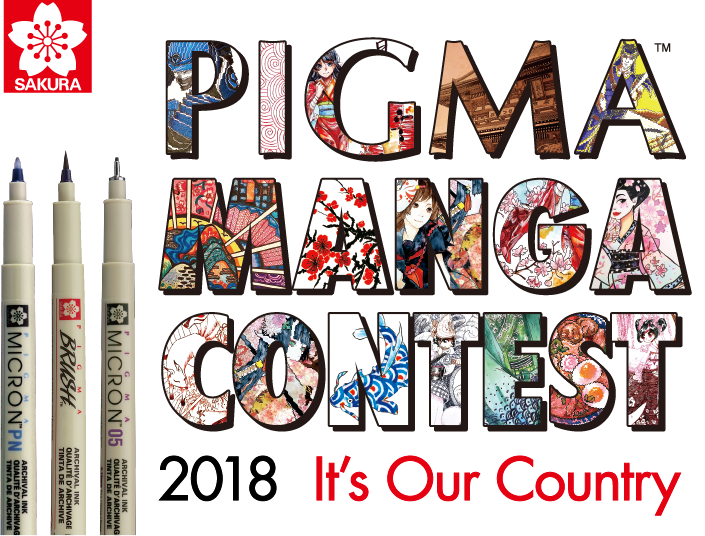 Express your image of your country in a one-sheet Manga or illustration with PIGMA series and the other Sakura products. Copyright infringement, such as the use of existing characters, is not allowed. Anyone who lives outside Japan (regardless of nationality). 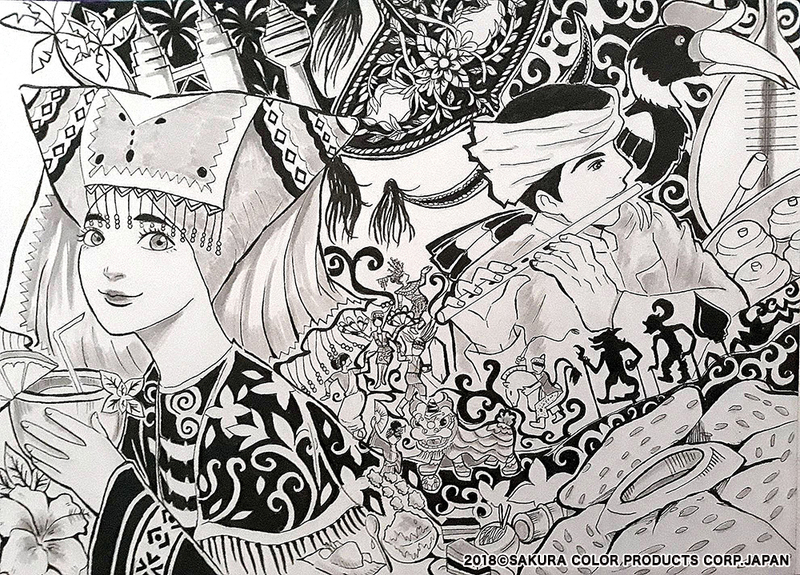 We, SAKURA COLOR PRODUCTS CORP. will inform winners of the result of this contest by e-mail. The e-mails will be sent to an e-mail address which is submitted at the entry. The prize can be cancelled if there is no reply to the e-mail within 7 days. Completed information about the applicant and the artwork. Clear and bright picture in scanned image of artwork in digital format (JPEG, JPG, PNG or PDF, less than.10MB). The width or height must be at least 1080 pixels. Applicants must agree the Entry Guidelines below: Please read the guidlines carefully, agree it by checking the box, and proceed to the next page form the button at the bottom. Then please fill in the entry form and upload a lile of your artwork for the entry. The winners will be announced on the website on August 1st, 2018 (Japan's Standard Time). Contact us through the web form below for queries. Please expect a reply within 5 business days. Please submit a work created using only with PIGMA series of Sakura Color Products Corporation. (hereinafter called "PIGMA") and the other Sakura products. 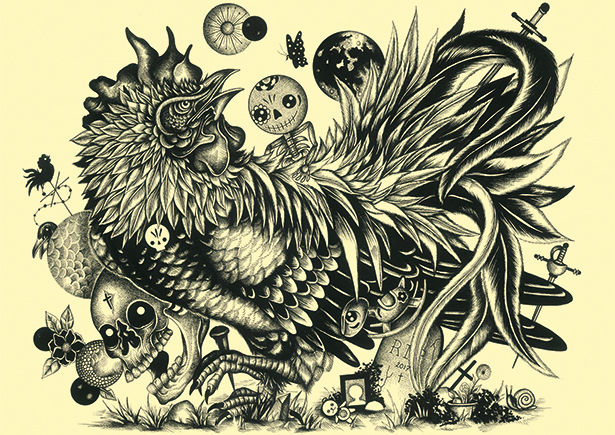 Submitted works will be displayed to the entire world on this gallery’s website. 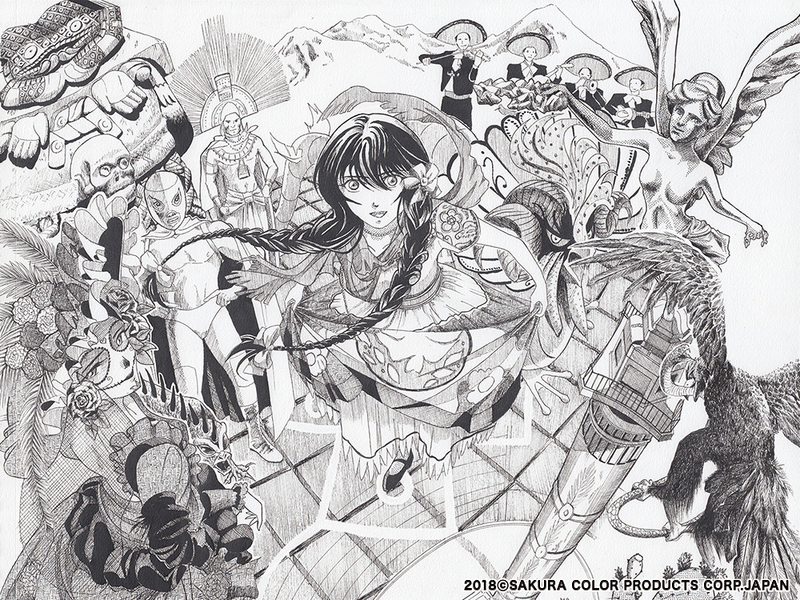 Artworks created using PIGMA and the other Sakura Products. Artwork data : Entry must be a clear and bright picture in scanned image of artwork. Digital Processing : Didital processing of drawing, painting and coloring is not accepted. The submitted artwork and comments will be presented on this website. We may use the artwork on other communications media without your permission. The submitted artwork must be an original work of its creator. Submitted artworks will be displayed on the website only after our company has determined that they meet the entry requirements. Artworks corresponding to those mentioned below, and the accompanying comments, will not be displayed. Artworks that infringe copyrights, artworks that infringe the privacy of other people, artworks that include trademarks, other artworks that infringe legal rights. Artworks offensive to public order and morals, artworks that violate a law or regulation, other artworks which our company judges to be inappropriate for display. Our company’s decision whether to display a submitted artwork will be final. No objections will be accepted. Our company may, without notice, delete or re-display the artwork that has been displayed. 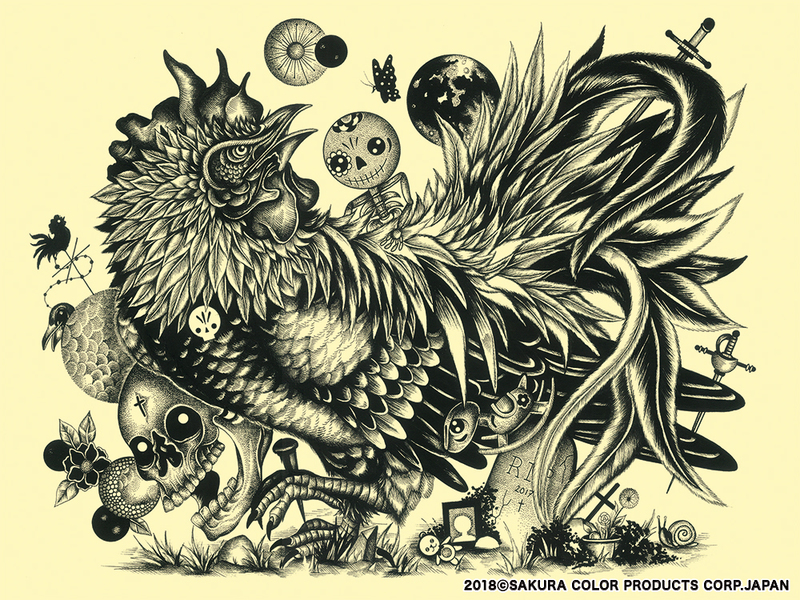 the artworks without the applicant's permission in other promotional tools for Sakura products. An applicant may not exercise the creator’s moral rights for the submitted artwork. Data of submitted artworks will not be returned. Personal information received from applicants will be used by Sakura for marketing, for providing information, etc., but will not be used for any other purpose. Without the applicant’s consent, information received from the applicant will not be provided to third parties other than our company’s business affiliates. For more about our handling of personal information, please visit here. Except for what is explicitly stated in. Entry Rule and elsewhere, Sakura shall not bear any responsibility for: damage that occurs for a reason not attributable to the responsibility of Sakura; damage that occurs due to special circumstances, regardless of whether Sakura was able to foresee them; damage to the applicant arising from lost profits or from a demand by a third party for damages. Sakura shall not bear any responsibility for damage to an applicant or a third party that occurs in connection with this solicitation for applications. Sakura shall not bear any responsibility regarding any complaint or other objection from a third party about a submitted work. The applicant shall be responsible for resolving such matters.